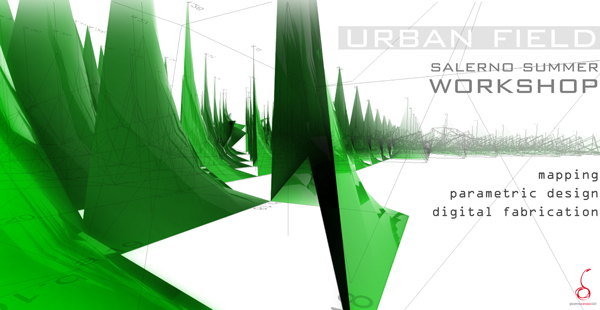 Third edition of the International Workshop in mapping, parametric design and digital fabrication. The third edition of digitalMed Workshop is structured as a design laboratory. Participants will learn the challenging process of producing ideas, projects and research analysis that are to be developed through specific software and concepts that emerge through the use of mapping, parametric design and digital fabrication. The workshop will take place in Italy, in the city of Salerno (Italy) and it will last 11 days structured into 3 intensive weekends: July 13-14-15 (mapping); July 19-20-21-22 (parametric design); July 26-27-28-29 (digital fabrication). We aim to make clear the theoretical and technical knowledge in the approach to parametric and generative design and digital fabrication. (From collection and data management, to the manner in which these inform the geometries, to the fabrication of prototypes.) Participants will also have the opportunity to practice the new knowledge gained in the design laboratory through project work. "Urban Field" Identify, study and analyze the system of public spaces in the urban area of the city of Salerno. Connection, mutation, generation and evolution are the themes to be followed in project work. Mapping. Our reality, in all its forms, has studied through concepts of the theory of Complex Systems. The techniques that will be used to study events and places of reality, will work for the management, manipulation and visualization of data and information. These will form the basis for project management and driven geometry, conducted during the second phase of the workshop. Parametric Design. Introduction to Rhino and Grasshopper. Specifically, we will explain the concepts with which to work with the software of parametric design and how they function. Through these tools, we will arrive at the definition of systems of mathematical and / or geometrical relationships that are able to generate and govern patterns, shapes and objects that will inform the final design. Digital Fabrication. In this phase, participants of the workshop are organized into working groups. Participants have access to materials and conceptual apparatus that will take them directly to the fabrication of the geometries of the project, with the use of software CAD / CAM interface and the use of machines for the digital fabrication. The DigitalMed workshop is organized by Nomad AREA (Academy of Research & Training in topics of Contemporary Architecture), in collaboration with the City of Salerno, the Order of Architects Province of Salerno and the National Institute of Architecture In / Arch - Campania.